June 17th marks the feast day of S. Giuseppe da Copertino. Though not an Abruzzo saint, he came from humble origins in Lecce which made his story appealing to Ignazio Silone who weaved him into his narrative about human suffering in the Italian region of Abruzzo in the last century. Giuseppe Maria Desa (1603-1663) was intellectually incompetent to the point of needing family intervention to enter the Capuchin Order as a lay brother. 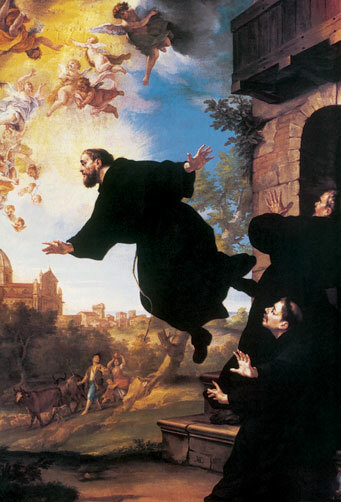 Bereft of scholarship, his religious energy manifested itself into episodes of levitation. Or so the story goes. Below is an excerpt from Silone’s 1930 novel Fontamara . Though many only think of Silone as a political writer – and he certainly is – I enjoy his ‘native son’ rendering of local stories and characters. Admittedly, most tales do manage to poke the authorities or some scoundrels in the telling. When Don Abbacchio came to the reading of the gospel, he turned to us and preached us a little sermon about San Giuseppe da Copertino. We knew the story, but we always liked hearing it again. For this saint was a cafone who became a monk but never managed to learn Latin, and whenever the other monks recited the psalms, he gave praise to Our Lady by turning somersaults wherever he might be, even in church. Our Lady must have been delighted at the spectacle, and to encourage and reward him she gave him the gift of levitation, and after that he had no difficulty in somersaulting all the way to the ceiling. He died at an advanced age, after a life of severe privations, and it was said that when he appeared before the heavenly throne, God, who knew him by repute and wished him well, because Our Lady had talked about him so often, embraced him and said, “I will give you whatever you want. Don’t be afraid to ask for whatever you like. The poor saint was utterly bewildered by the offer. “May I ask for anything?” he asked timidly. But San Giuseppe da Copertino did not dare confess what he really wanted. He feared that his immoderate wish might arouse the Lord to anger. Only after much insistence on the Lord’s part, only after He gave His word of honor that He would not be angry, did the saint confess what he most wanted. And the Lord was as good as His word and did not grow angry, but embraced the cafone saint, and was moved and wept with him. And then, in His voice of thunder, He summoned twelve angels and gave orders that every day from morning till evening for all eternity they should give San Giuseppe da Copertino the best white bread that was baked in Paradise. That was the true story of San Giuseppe da Copertino as handed down from father to son in our part of the world, though of course no one can guarantee the correctness of every detail. Nevertheless, we Fontamaresi liked it and never tired of hearing it.